Seventeen( Hangul : 세븐틴), also stylized asSEVENTEENorSVT, is a South Korean boy group formed by Pledis Entertainment in 2015. The group consists of thirteen members divided into three sub-units, each with a different area of specialization: a 'Hip-Hop Unit', 'Vocal Unit', and 'Performance Unit'. Seventeen has released two studio albums and four extended plays.The group's members are deeply involved in the composition and production of their discography and choreography and have been since before their debut, which prompted their nickname as a "self-producing" idol group . SEVENTEEN has returned with another hit album! , broadcast on MBC between May 2–26, 2015. The show concluded with the group's debut showcase. 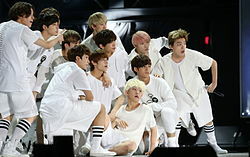 Seventeen performing at the 2015 Summer K-POP Festival at the Seoul Plaza . 17 Caratbecame the longest-charting K-pop album of the year in the USand was the only rookie album to appear on Billboard 's "10 Best K-pop Albums of 2015" chart. .On February 14, the official fanclub nameCarat( Hangul : 캐럿) was announced. , which included venues in South Korea, Japan, Singapore, Australia and China. Seventeen performing "Don't Wanna Cry" at Dream Concert 2017.
after filming the series during their stay in Japan. The second season was titledOne Fine Day in Japanand was created in collaboration between South Korean broadcaster MBC and Japanese network Music On! TV . Chapter 0.5 Before AL1were subsequently uploaded. , during which they visited thirteen cities in Asia and North America, on October 6.
selling over 215,000 copies in its first week alone and therefore setting a new record for the group. "Thanks" reached first place on iTunes charts in 29 countries, including countries from North America, South America, Europe and Asia, proving it to be the group's most popular release yet worldwide.Timemagazine named Seventeen one of the best K-pop groups during this promotion period. , a common nickname for the three members together. The group released their debut single "Just Do It" and enjoyed a short promotion period. The music video for the lead single "Call, Call, Call!" was released on May 16.
concerts in Seoul and concerts scheduled in other countries in Asia. Seventeen earned three rookie awards in their debut year, and have since earned fourbonsangs. They have also gained several awards for outstanding choreography and dance performance. Herald, The Korea (2015-05-26). "Seventeen hopes to shine like diamonds with '17 Carat'". www.koreaherald.com. Retrieved 2016-05-09. Benjamin, Jeff (2016-05-04). "Seventeen Send Their 'First Love&Letter' to Top 5 of World & Heatseekers Album Charts". Billboard. Retrieved 2016-07-30. "세븐틴 세 번째 콘스트, 다양한 무대로 팬들 매료" [Seventeen's third concert, captivated fans with various stages]. HEI (in Korean). November 23, 2013. Retrieved March 14, 2016. "세븐틴, 데뷔전 마지막 콘서트 연다..'최종 점검'" [Seventeen, last concert before debut revealed...'the final check']. OSEN (in Korean). August 12, 2014. Retrieved March 14, 2016. "세븐틴 프로젝트' 첫 방송…13色 매력 담았다 '리얼+열정'". Naver News. 2015-05-02. Retrieved 2016-07-31. Won, Ho-jung (2015-05-26). "Seventeen hopes to shine like diamonds with '17 Carat'". The Korea Herald. Retrieved June 21, 2015. Benjamin, Jeff (2015-05-30). "Here's What a 13-Member K-Pop Boy Band Looks Like: Watch 'Adore U' by Seventeen". Billboard. Retrieved 2016-05-15. Benjamin, Jeff (2015-12-22). "K-Pop's 2015 Rookies: Who's Working It, & Who Needs Work". Fuse. Retrieved 2016-05-15. Benjamin, Jeff; Oak, Jessica (2015-12-30). "The 10 Best K-Pop Albums of 2015". Billboard. Retrieved January 16, 2015. Kim, JiYeon (2016-01-16). "KPOP NEWS - Seventeen is Only Rookie Group to Make Billboard′s Best K-Pop Albums List | Mwave". Mwave. Retrieved 2016-05-09. "2015년 38주차 Album Chart" (in Korean). Gaon Chart. Retrieved September 22, 2015. Kaur, Gunjeet (2016-06-15). "Seventeen to return with a brand new album". International Business Times. Retrieved 2016-07-30. "아이콘·세븐틴·여자친구, 신인상 수상 [25th 서울가요대상]". Naver News. 2016-01-14. Retrieved 2016-07-30. "세븐틴, '빌보드 21 Under 21' 아시아 가수 유일 선정". Naver News. 2015-11-01. Retrieved 2016-07-30. Partridge, Kenneth (2015-10-30). "Billboard's 21 Under 21 2015: Music's Hottest Young Stars". Billboard. Retrieved October 31, 2015. "세븐틴 첫 콘서트, 티켓 오픈 1분 만에 매진..'기염'". Naver News. 2015-11-24. Retrieved 2016-07-30. "세븐틴, 앵콜콘서트도 5분만에 전석 매진..치열". Osen. 2016-01-19. Retrieved January 19, 2016. "세븐틴, 팬클럽 명 '캐럿' 첫발표 "우릴 반짝반짝 빛나게 해"". Mydaily. 2016-02-14. Retrieved February 14, 2016. "세븐틴 'LOVE&LETTER' 日오리콘 팝 앨범 랭킹 1위". Nate News (in Korean). 2016-05-06. Retrieved 2016-09-01. "국내 대표 음악 차트 가온차트!". gaonchart.co.kr. Retrieved 2016-07-30. "[포토엔]세븐틴 '1위 공약 2층까지만 완성된 인간탑'(쇼챔피언)". Newsen (in Korean). 2016-05-04. Retrieved May 4, 2016. "[단독] 세븐틴, 7월 초 리패키지 앨범으로 컴백·하반기 아시아 투어…2016 '특급 대세돌' 굳히기". Newspim. 2016-06-13. Retrieved June 13, 2016. "세븐틴 측 "원우 건강 문제로 활동 중단, 12인 체제로.."(공식입장 전문)". Newsen. 2016-06-15. Retrieved 2016-07-30. "[NOTICE] 2016 SEVENTEEN 1st Asia Tour: SHINING DIAMONDS 안내공지". Seventeen Official Website. Archived from the original on May 16, 2016. Retrieved May 15, 2016. "세븐틴, 단독 콘서트 전석 매진..'대세의 길'". Naver News. 2016-06-25. Retrieved 2016-07-30. "세븐틴, 12월5일 컴백 확정..미니음반 'GOING SEVENTEEN'". OSEN. 2016-11-21. "확실하게 뜬 세븐틴, 더 높은 곳을 향해 '붐붐'". Naver News. 2016-12-26. Retrieved 2016-12-17. "세븐틴, 日 단독 콘서트 성료‥국내외 대세돌 입증". Retrieved 2017-02-24. "세븐틴, 사상 최초 '어느 멋진 날' 재출연...일본서 생존력 검증". Retrieved 2017-02-24. "여서도→일본…세븐틴 '어느 멋진 날' 한번 더 떠난다" (in Korean). 2017-02-24. Retrieved 2017-04-05. "세븐틴, 22일 컴백 예고… 2017년 첫 프로젝트 영상 기습 공개" (in Korean). Ten Asia. "세븐틴, 프로젝트 타임테이블 공개..하반기 활동 예고". Retrieved 2017-09-17. "세븐틴, '2017 SEVENTEEN PROJECT' 타임 테이블 공개…컴백 예고" (in Korean). Ten Asia. "[공식입장] 세븐틴, 하반기 정규 2집으로 컴백..'프로젝트 챕터3'". Retrieved 2017-09-17. "[NOTICE] 2017 SEVENTEEN 1ST WORLD TOUR "DIAMOND EDGE" 월드투어 안내 [+ENG/JPN/CHN]". May 13, 2017. Archived from the original on August 6, 2017. ""세븐틴이 온다"…프로모션 타임 테이블 공개" (in Korean). Ten Asia. "세븐틴, 정규 2집 'TEEN, AGE' 21만 장 돌파..'전작 넘어섰다'". Retrieved 2017-11-12. "[단독] "글로벌 대세 입증"...세븐틴, 2월 5일 컴백 확정" (in Korean). Sports Chosun. "[공식입장] 세븐틴, 2월 5일 가요계 컴백…'디렉터스컷' 스케줄 공개" (in Korean). Osen. "[Hi #뮤직]컴백 앞둔 세븐틴, 왜 '스페셜 앨범'일까" (in Korean). Star Hankook. "컴백 D-8 세븐틴, 스페셜 앨범 마지막 포토 공개 [공식]" (in Korean). Tvreport. "세븐틴, 아이튠즈 29개국 1위 연일 기록 경신…해외서도 인정한 앨범" (in Korean). isplus. Bruner, Raisa (February 9, 2018). "These Are the Best K-Pop Groups You Should Know About". Time. Retrieved February 11, 2018. "[단독] 세븐틴, 첫 스페셜 유닛 '부석순' 출격…3월 신곡발표" (in Korean). Osen. "[공식입장] 세븐틴 측 "호시X승관X도겸, 스페셜 유닛 3월 공개"" (in Korean). 서경스타. "세븐틴, 日 데뷔 깜짝 발표…"5월, 같이 꿈 꿀까요?" (요코하마)" (in Korean). Dispatch. "세븐틴(SVT), 16일 미니앨범 'YOU MAKE MY DAY' 발매…깜짝 컴백 소식 알려" (in Korean). Top Star News. ""컴백 예고 이어 달달 팬사랑"…세븐틴의 말말말" (in Korean). MBN Star. "세븐틴 프로필" (in Korean). Naver. "Seventeenday". Archived from the original on April 22, 2017. Retrieved February 26, 2017. "세븐틴, 사상 최초 '어느 멋진 날' 재출연...일본서 생존력 검증". Naver News. 2016-12-26. Retrieved 2017-03-12. "세븐틴, 새 리얼리티 'SVT클럽' 선보인다…韓·日 동시 방송". Naver News. 2018-03-12. Retrieved 2018-03-14. Wikimedia Commons has media related toSeventeen.